We wrote about Katushka in 2007. Now, a Katushka variant named Katushka-9-5 was identified to have less citotoxicity in bacteria, HeLa cells and X. laevis embryos. This variant was further optimized by semisaturated site-directed mutagenesis to obtain two fluorescent protein variants with further red-shifted emission (eqFP650 and eqFP670). The picture depicts some characteristics of current far-red fluorescent proteins. 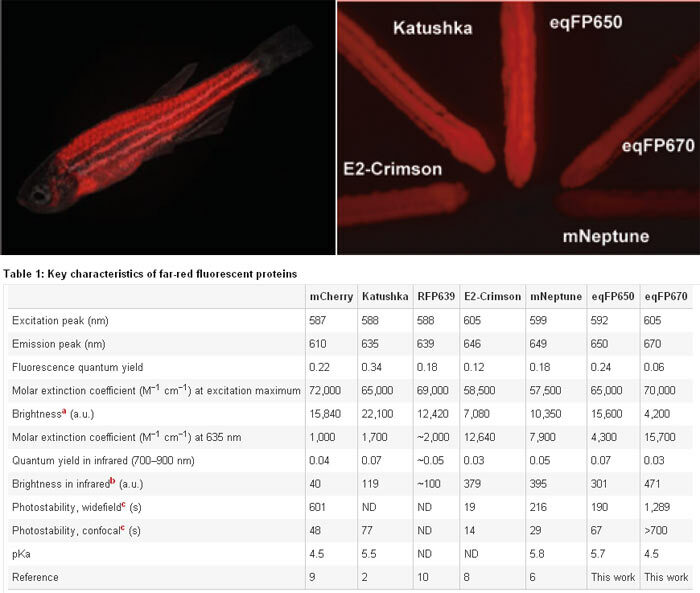 This far-red rodeo aims to find the optimal protein for deep-tissue imaging (see the zebrafish on the left). In the right image there are just bacterial streaks (although they utterly seem feasting fishes). EqFP650 and eqFP670 are property of Evrogen.